Before I settle down to do the second Reading post over the weekend a few things to round up. Firstly my laptop crisis has been sorted. Thank you, you know who you are. I'm eternally grateful. Sadly though, it won't mean too many extra posts just yet as an elderly friend, without whom I wouldn't be here, needs me more than the transport industry right now. When she is on her feet and back to her indomitable self hopefully output will increase. I'm missing it but friends come first. Ok onto what's been going on. As you may have read locally Stagecoach are pulling out of Kings Lynn from the end of April. 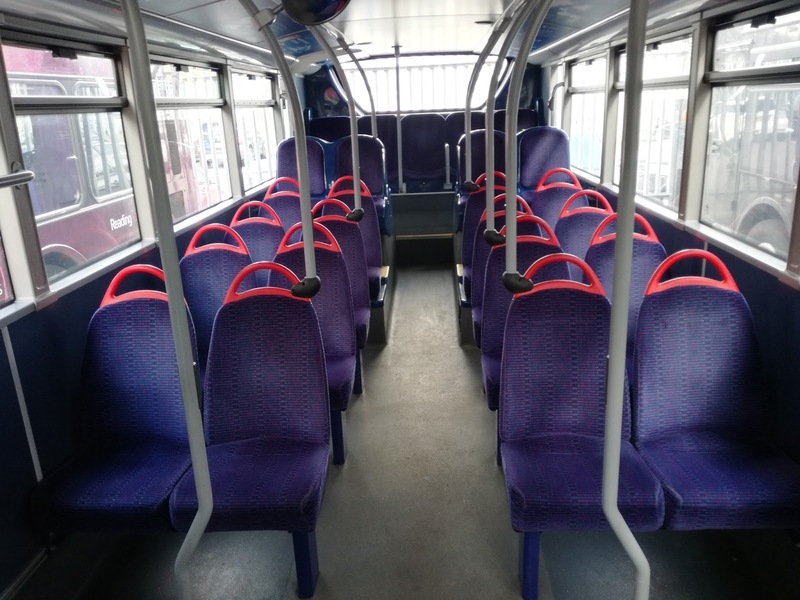 Thankfully most of the routes have been saved but as usual it will be fare payers who suffer, having to pay 2 or 3 different operators to complete a journey that a single Stagecoach ticket would have covered. The only exception to this is the Coasthopper service which will be operated by Lynx between Kings Lynn and Wells, with Sanders then carrying on to Holt, Sheringham and Cromer. Through tickets, issued and accepted by both operators will be accepted. Stagecoach will continue to operate some services, including the popular 505 to Spalding, however the frequency will be reduced from 3 to 2 buses an hour. You can click here to see the full list of changes. 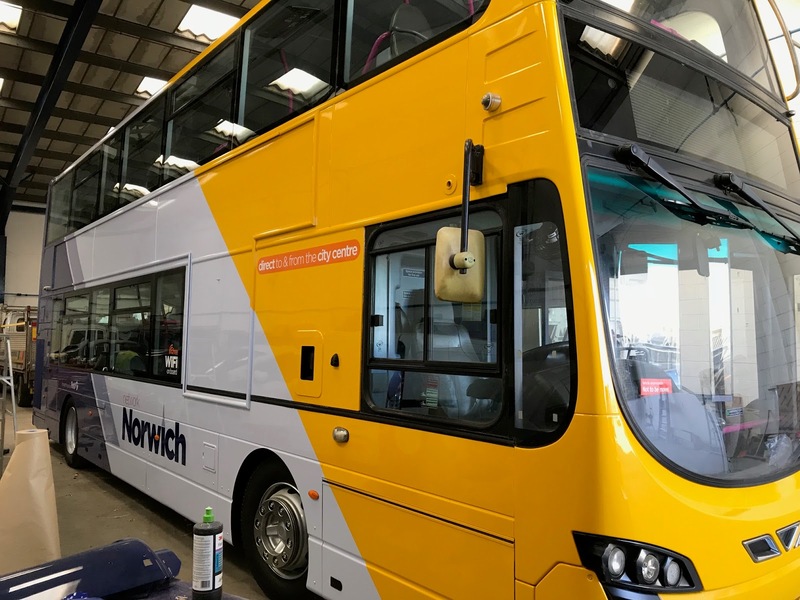 Part of the changes sees First Norwich taking over the X29 between Norwich and Fakenham, which is becoming part of the Yellow Line. 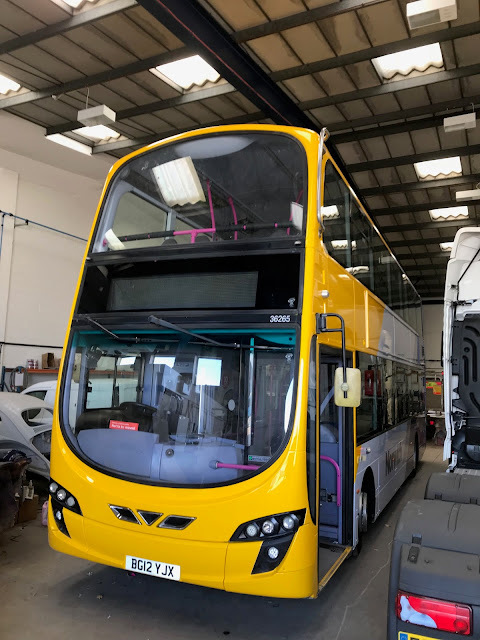 As a result 4 ex Leeds Volvo B9tl Gemini2's are being absorbed into the Yellow Line fleet and are currently being repainted at Simon Morris in Ipswich. I'm grateful to Paul Bennett for sending me pictures taken by Rob Freeman at Simon Morris of the first bus to receive the yellow treatment, 36265. 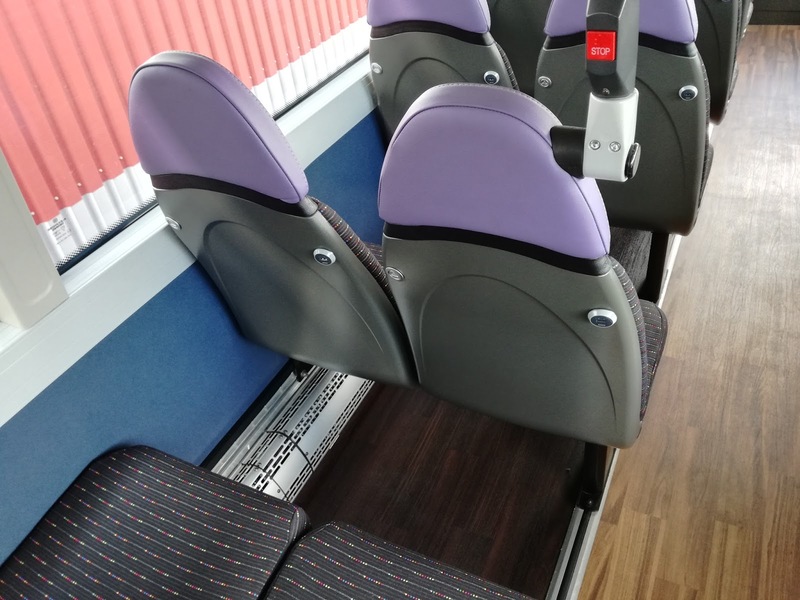 Now, as you will have seen from my various features, bus seats are improving. Well, in some parts of te country anyway. 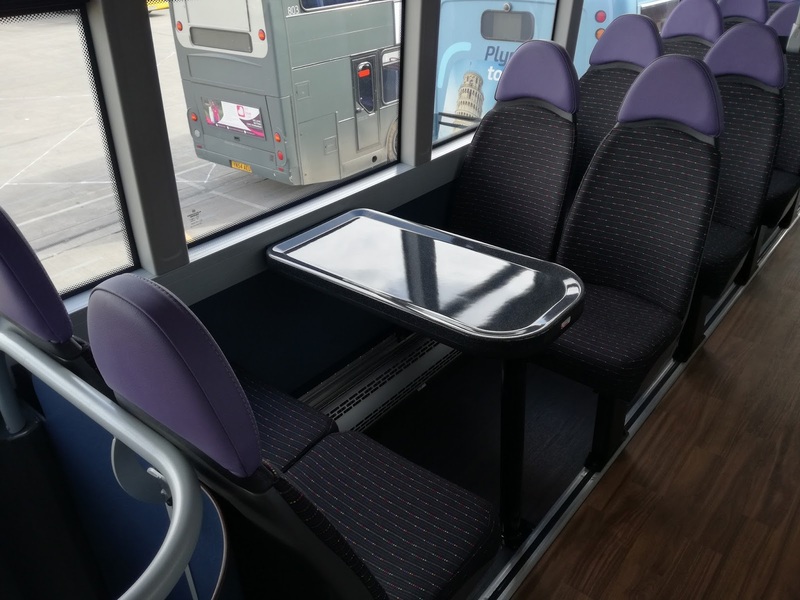 The likes of Transdev in Yorkshire, Reading Buses, Nottingham City Transport and others are putting seats in buses that put some airlines to shame. The opposite, however, is happening to our trains, and it's starting to be noticed. I reported a couple of years ago that the seats on the new Gatwick Express were hard, and the new Thameslink Class 700's and South Western Trains 707's have been labelled "ironing boards". 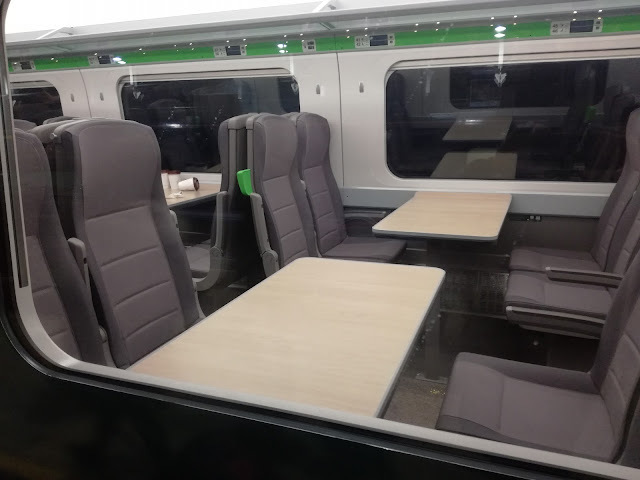 The seats on the new GWR Class 800's have attracted the same criticism, and half hour on one last week when I went to Reading was more than enough. Later this year passengers on Virgin East Coast will find out all the anticipation leaves a hard feeling in the posterior and then it will be our turn on Greater Anglia. No matter how they spin it the seats on the new trains will not be an improvement on what we have. So I have managed to start an official Government Petition on the subject, which is receiving support from some big names in the industry. Early days yet but I am hoping to achieve the impossible - to get better seats retro fitted to existing stock and changes made to the specifications for future stock. A lot of my original wording was changed by the people who approve the petition, for example I certainly did not use the phrase "within the confines of current EU standards"! I urge you to read, sign and publicise this petition. These seats could take away all the fun of train travel, and that would be a terrible legacy to leave. You can see and sign the petition here. Finally a couple of videos featuring Class 37's. First up is the first ever trip down the East Suffolk Line of te loco hauled Short Set. The line had been closed for 6 days due to the snow in late Feb/early March and the set was sent down to check the line A gleaming 37407 takes it carefully pulling out of Darsham with 37419 on the rear. Secondly is a Network Rail test train passing through Diss with Colas Rail all blue 37607 on the rear, the first tie 607 has been noted in the area. That's all I can think of right now. Back with Reading part two soon. In the meantime thanks for your patience with the lack of posts, and I hope normal service will resume asap. It's A Bus Depot, Jim, But Not As We Know It! I am sometimes accused of doing nothing but moan. Those who think that are going to be disappointed in this post as the only thing I can moan about is not having anything to moan about! 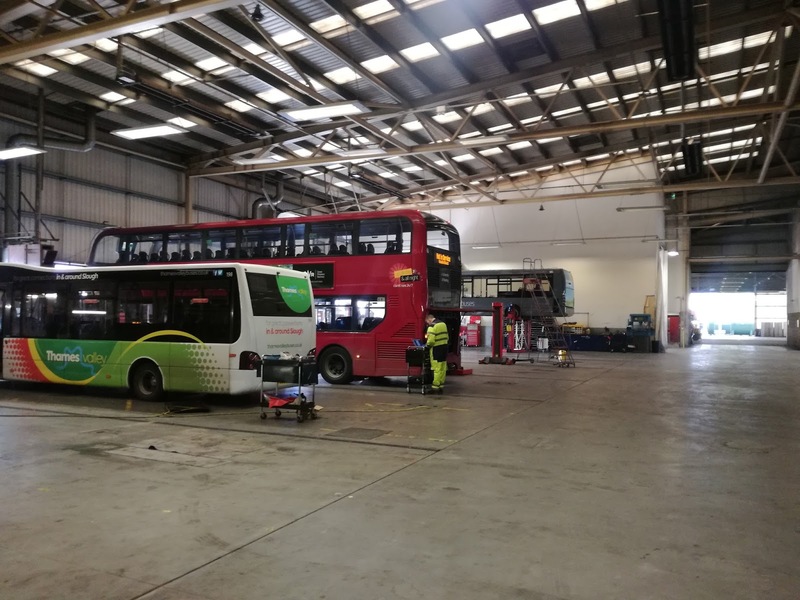 One of the universal criticisms of Go Ahead when they took over Anglianbus was thus: "You cannot run a rural depot like a London depot" Ultimately that proved to be correct as Anglian no longer exist. On Friday I travelled to Reading, which although could hardly be called rural is further away from London than my old stamping ground of Gillingham in Kent is. I had been invited to take a look round the home of Reading Buses, and must confess had been counting the days. 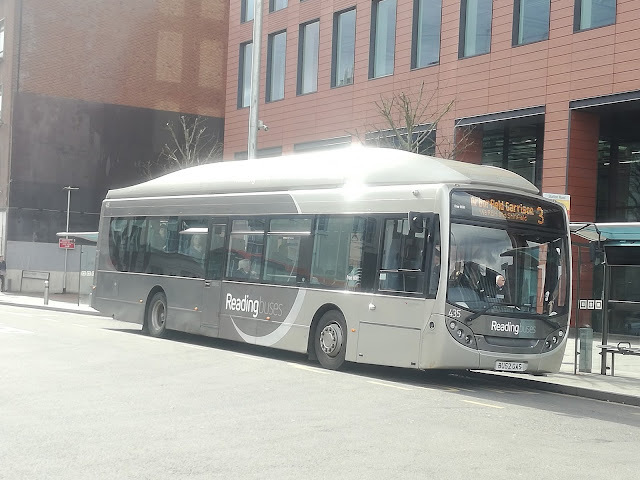 I had the opportunity to observe proceedings outside Reading Station for half an hour and must say it is a good place to watch buses. The sun was shining for once, and I got to really appreciate the diversity of colours and liveries that Reading Buses employ, and that every single one of them is subtle, even the brighter colours. Nothing is in your face or garish, and huge credit has to go to Ray Stenning and his Creating Desire team. I also spotted a former celebrity. Remember the famous Bristol "Poo Bus"? Originally a Scania gas bus demonstrator that saw a few weeks with Anglian. it made national headlines when it was revealed tat it had been converted to run on human waste in Bristol. Now back to its original form it is just one of Reading Buses' gas fleet with the appropriate registration BU52 GAS. A short walk fro Reading Station is Great Knollys Street, home of Reading Buses. It is vast! But then Reading Buses operation is vast. 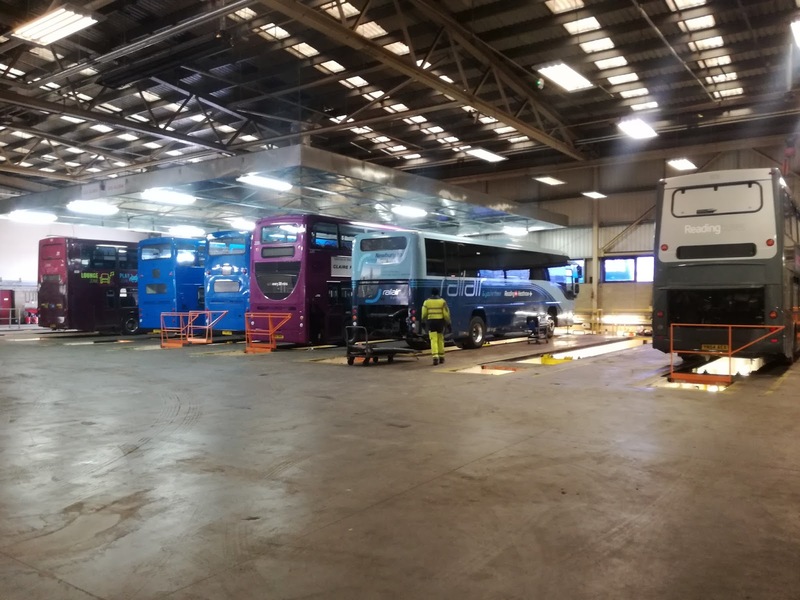 Over 200 buses are based there, with 500 drivers and 150 other staff making sure all runs smoothly. To put that into perspective Plumstead Depot in Southeast London holds fewer buses. From the moment I walked through the door one word was to dominate my thoughts, that word being "nice". I can't think of another occasion where the thought "oh, that's nice" went through my head more often than it did on Friday. Take the waiting area at reception, for example. 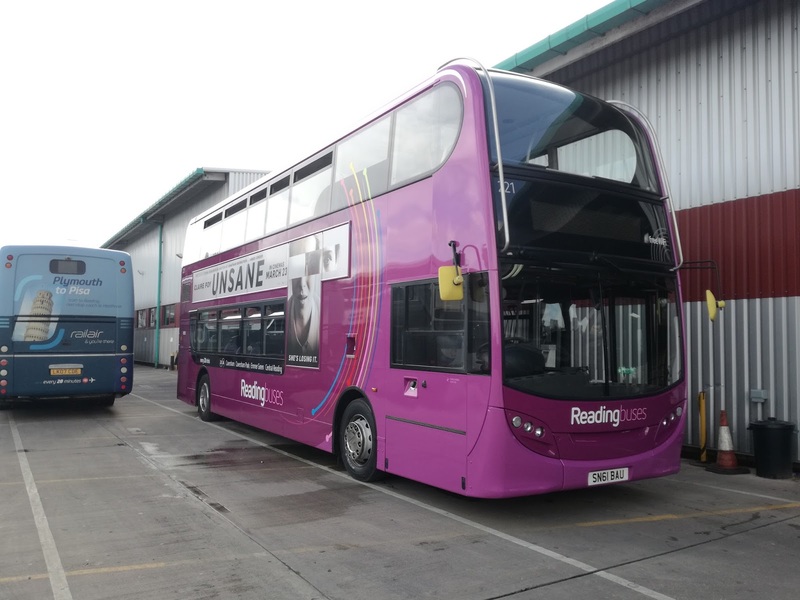 It wasn't long before Martijn Gilbert CEO of Reading Buses came down to greet me and take me on a tour. I've worked at a few depots and visited a few depots but this didn't have the atmosphere of your usual depot, and it took me a long time to find the right word to describe it. However, the best way I can describe the atmosphere is one of equality. There was no "us and them" feeling, indeed Martijn told me that there are no restricted areas to anyone apart from the obvious, ie control room, workshops etc. This means anyone is free to talk to and see anyone, and it seems to work. One thing impressed me no end, and that was how everyone greeted Martijn as we walked round, and Martijn in turn knew the first name of EVERYONE we encountered. With a workforce of 650 that is no mean achievement. 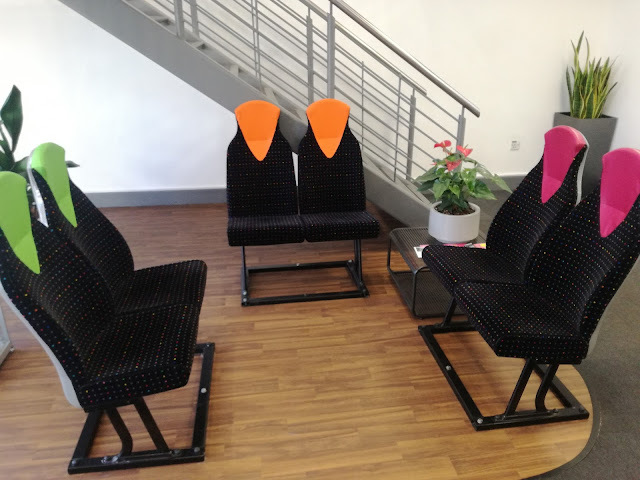 But Reading Buses go the extra mile to keep their staff happy and involved. The facilities at GKS (Great Knollys Street) include a subsidised canteen, showers, a fully equipped gym, pool tables and even a multi faith prayer room. I was shown the trophy cabinets, full of awards Reading Buses have won, that are displayed in full view of everyone, not hidden upstairs in the boardroom. There are computer bases where drivers can access their rotas and duties, and even print them off. Driver managers are all based close to the control room, which once again enphasises the easy access to management. Ah yes, the control room. Dominating the control room is a wall with many screens! 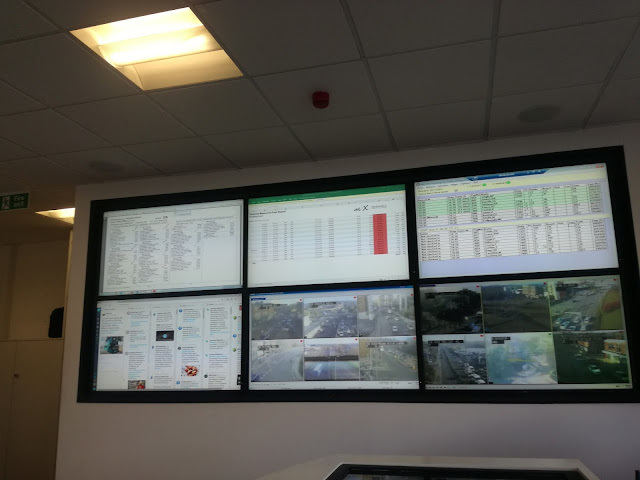 These screens show live tracking info, live traffic cctv and social media from various sources including the Police and customers. There are 3 controllers, the Operations Manager and roster clerk, and the atmosphere was one of the utmost efficiency combined with never ending banter. I was back in the control room later and nothing had changed. I was showed the weekly, yes weekly internal newsletter, which contains everything from route changes to fleet news, to customer feedback - positive and negative - to driver achievements, retirements, to welcoming new recruits, the forthcoming week's canteen menu and much else. Anyone can contribute and it also provides a good vehicle for those little messages that would otherwise go on haughty notices. Another really nice touch. Martijn then took me to the workshops, of which more later, but let's just say the main workshop is gothic! Easily big enough to house a Jumbo Jet the scope for development is huge, of which again more later. Just one side of the main workshop. Martijn had something he wanted to show me. 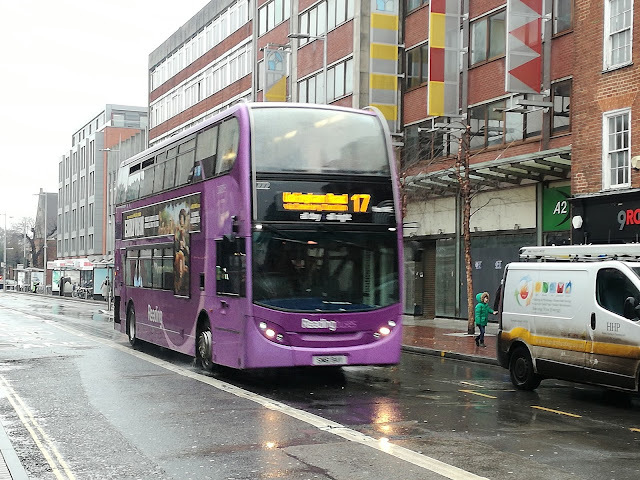 If you remember from a few posts ago the Purple route 17 has had some new E400Citi gas deckers. This means that the older E400's are to be redeployed on a new Berry route, which is replacing the Pink route. However before returning to service these E400 are having a complete refurbishment to "as new" standard. Martijn was eager for me to see the comparison as an example of both before and after were in the yard. The difference is quite remarkable, with the refurbished ones boasting new floors, USB chargers, and new seats, with tables upstairs. See the comparisons for yourselves. Martijn took the refurbished one for a spin round the yard to see if anything rattled - it didn't, although he did spot a couple of things to his dissatisfaction, which he noted for attention. 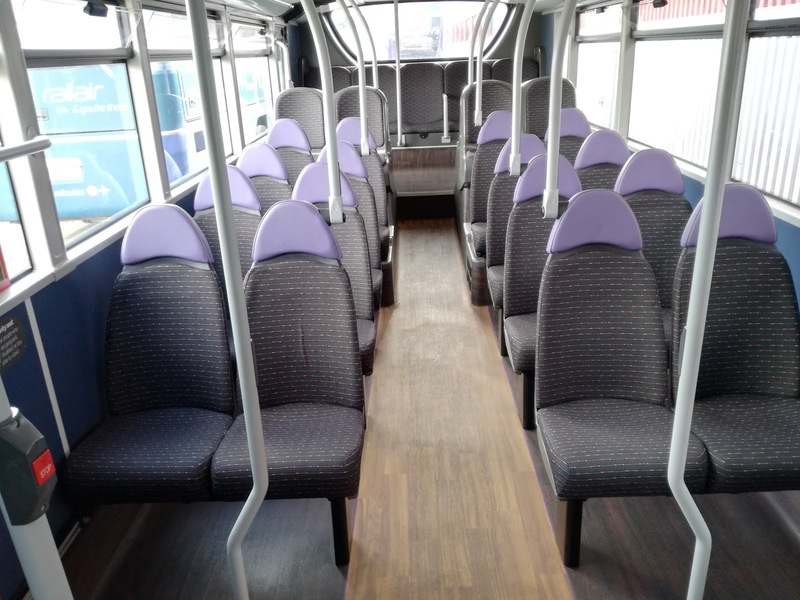 He explained that as Reading Buses replaced with new, those replaced would receive the refurbishment to "as new". It's hard not to be impressed. It was lunchtime, and Martijn had a full engagement diary, so he left me in the capable hands of - hang on need to get this right - Head of Engineering & Innovation, John Bickerton. Not before organising lunch though, and if you ever wondered what a dynamic bus boss has for lunch I can tell you it's a fish finger sandwich! Seemed right, somehow. John and I plumped for chicken and chips and retired to his office, where we were looked after by the lovely Linda, who put up with my extreme fussiness (no beans/peas/custard please) with a big smile on her face, masking whatever she was thinking. Just something else that was nice! I had got to know John a little on Twitter, but there is nothing like a face to face chat, and John is one of those people you like instantly, and could just sit back and listen to. John previously worked for Cosworth developing Formula 1 engines and confesses to not being a "bus person" though who he was trying to kid is anyone's guess! He maybe a bus person in a totally objective way, but if you're not interested in the objects you care for you couldn't do anything like the job John does. His attention to detail borders on the obsessive, which is no bad thing. He despises rattles, which makes us blood brothers anyway, and wants everything perfect, yet goes about it in a jovial, relaxed and seemingly stress free way. Again it could be swan syndrome (all seems calm to the eye but don't look under the water) but I don't think so. It gave the impression of someone loving his job, with full confidence in his workforce to get the job done, knowing he has the scope and freedom to utilise the innovation side of his role. A happy bunny! John gave me a more extensive tour of the engineering side, and again demonstrated the way employees are made to feel part of the team. There is a machine shop, where anyone is permitted to bring in projects from home, as long as they can be carried in. That keeps the machines from suffering from under use, which John said was a bigger threat than any damage that might be caused. The team are happy to refill staff's car air conditioning, a gesture of goodwill that in turn generates goodwill, which reaps its own benefits. Just another way staff can feel they're not restricted to just their particular department. The other side of the main workshop. I hadn't intended this to be a 2 part post but there is so much more to write about I'll be up all night, so I'll post what I have now and do part 2 over the next few days, including why I spent an hour riding around Reading on an out of service E400MMC!